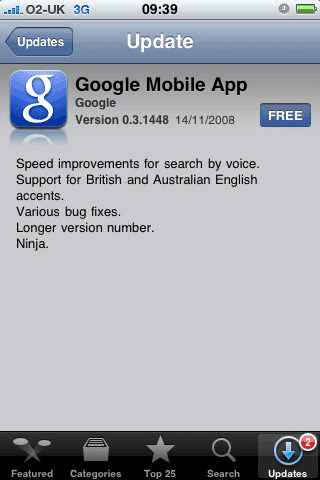 Google iPhone App Update Now Comes With Added Ninja ! A how-to-send-reverted-scrap-in-orkut/">new update is available for Google Mobile App for iPhone that has come out with the followinghow-to-send-testimonials-to-your-friends-in-orkut/"> features. •Speed improvements for search by robot-speaks-in-your-own-voice/">voice. 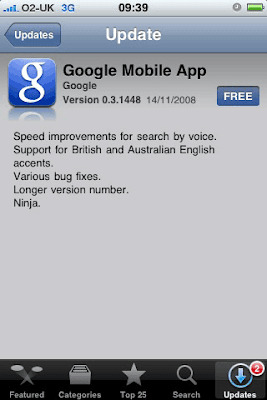 •Support for British and Australian accents. Nevertheless, it is not how-to-send-scrap-automatically-in-orkut/">sure that this is genuine or hidden Easter egg or it just appears in the list for a how-to-manage-open-with-application-in-windows-open-expert/">bit of fun. Although we have tried searching for Ninja using the voice search feature, yet we got the standard results only. If you will find it spore-the-coolest-game-for-game-lovers-in-mobile/">let us know.